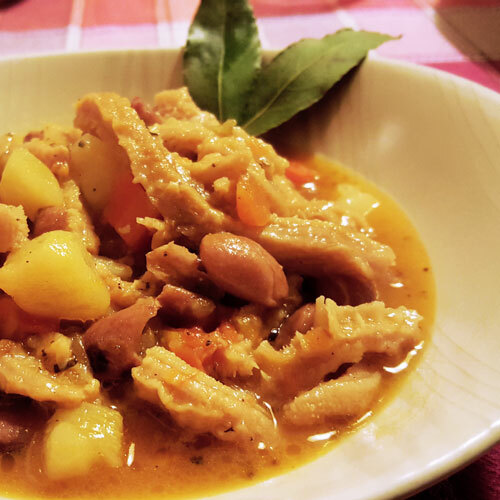 Milanese-style tripe (Trippa Meneghina) is a traditional Milanese dish, an incredibly tasty peasant recipe made with inexpensive but nutritious, high-protein ingredients. This dish is ideal during winter months. Clean the tripe with care and cut it into strips. Sauté the chopped vegetables (onion, carrot and celery) in a casserole with a garlic clove and 2 sage leaves. Add cubed sweet bacon and lightly fry in some butter or olive oil for a couple of minutes. Add the tripe and cook for 5 minutes. Add smashed datterino tomatoes, salt and pepper to taste. Cover the tripe in vegetable stock and allow to simmer for about 3 hours. Add grated Grana Padano cheese. About 30 minutes before the tripe is ready, add peeled and cubed potatoes. About 15 minutes before turning the stove off, add pre-boiled beans to the tripe.